When you were starting out with your business, there’s a good chance nobody told you that ‘marketer’ will become part of your job description. Unless you’re willing to hand over all the work to the professionals, it’s in your best interest to figure out how online marketing works and how you can use it to your advantage. 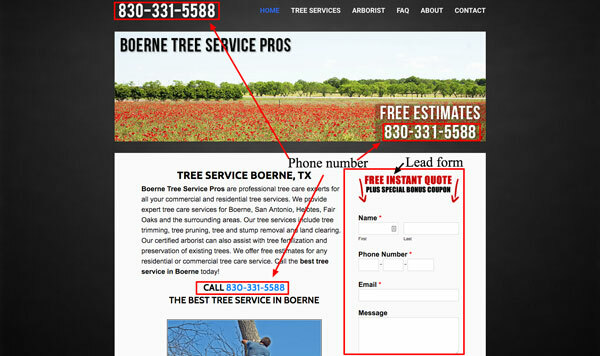 I took a look at one of my client’s websites, Boerne Tree Service Pros (http://www.boernetreeservicepros.com) to use as an example of how you can market your business online. A while ago, it was all about figuring out how to make the most creative ads to show in the real world: TV networks, billboards, flyers and so on. These methods of advertisement have largely been replaced by the online battle for clicks – there’s really only one medium now, and it’s a major one. That’s not to say you should ignore real-world advertising completely: a couple of ‘physical’ ads in the right place can still have a great impact, especially on demographics that have a dislike for the internet. If all this sounds confusing to you, consider asking for professional help. Here are a few tips for your website, have a look at the image below. Have your phone number in multiple areas on your website that is also clickable from a mobile device. Have a lead form that people can fill out and send to you via email/text. Create a YouTube channel for your business. YouTube is the second largest search engine, 2nd only to Google, AND it’s owned by Google… very important. Here’s an example of the video’s we created for our client. As a business grows more successful, the incentive to work with a SEO company becomes larger and larger. A DIY attitude is a great thing to have, but truthfully, your knowledge will never compare to that of a professional no matter how many learning hours you put in. These days, SEO experts are utilized by virtually every type of business: from large conglomerates to smaller enterprises, everyone can make good use of what they offer. Just because you own a smaller business like a tree service company doesn’t mean you should pass up on their services because you “don’t need them” – you do, and the money you invest should pay itself off in no time. If you play your hand right, the positive impact of a SEO company’s work will be felt long after you finish working with them. The best part? You are free to continue where they left – you’ll know exactly where to go from there and the difficult initial stage will be behind you. Previous Previous post: Mix Networks mixing it up!